Note: at the moment it's only available for iPod video (5g) but I hope I will have some time to make one for the iPod Color too. I would like to thank again to S3TUP for the great girl with the rocbox in her hand, and to Pete for the black iPod 5g suggestion, and to Ivo Burkart for his bootsplashscreen patch which was a great start to make my own. When do you think the iPod Color version will be done ? Sorry, but I won't finish the photo edition of this because there is a huge bug in it which I wasn't able to figure it out. The problem is that the bootloader won't load the original firmware, and there are persones who still use it somtimes :) so I won't port it to the photo ipod till I wasn't able to fix this. Jon_ was so kind to offer his help on this, so now I'm waiting for his results, hope it gets fixed somtimes in the near future because I have some plans to make it more user friendly (I mean the coding) so others can easily add their one custom themes to the bootloader, but that's something that may never happen if we can't fix this anyoing bug. Hey, when you plan to release new version? In last version I have problems with scroll accelerator (iPod 5G) - it is not possible to scrool it to direct place in folder tree without problems - it all the time jumping with big steps. It would be cool to get new version without such bug. Thanks a lot for this help with parameters. It helped me. 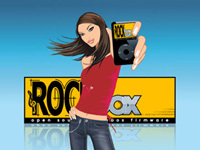 By the way, you rockbox releases rock, I love them so much and use only them ;) Thanks a lot. Not really a fan of the girl holding the iPod. I'm a very bland and conventional person. (Lol, yep) I love your themes, everytime I use them on my iPod, people always peer over and look at it. They are real crowd pleasers. If it is possible for me to change the splash (or opening/loading screen) to the original, could I? I'm not the most computer savvy person in the world, but I learn fast. I just like to change things for personal use. PS: If it is possible to have a load screen in the picture of green grass like in the jBlackGlass theme, that would be great too. Also saying sorry ahead of time if I have asked something I shouldn't. I don't think the problem is with the bootloader because I'm just using your theme without the custom bootloader and I'm still not able to get back into the apple firmware. Having an issue with your custom build. the daily build of rockbox (ipodvideo-20060824)did install and runs correctly(save for some skipping issues, and im using Loader2 for easier control of switching), but when i install your build onto my ipod (5g 64mb video), it comes up and says files not found, and more or less locks me there, i cant get into menus,settings or anything. i reboot it and get it to disk mode and put the daily build back on, and all is well. I will try to answer all your questions in this entry, and please accept my appologies for doing this just now. The bootloader won't boot the original firmware, I tried my best to fix the bug, two others have tried to fix it too, but we didn't have any succes on it, so for now it will only show if you boot into rockbox. Sorry to hear that you can't boot into your original firmware even with the original bootloader, there is something wrong with it then, but if I reupload the rockbox's original bootloader I can boot into the apple firmware without any problem, so it seems the bug is somehwere in my bootloader, but anyway thanks for the notification. The skiping issues are not build related, they have to be optimized in the playback sources, regarding the file problem, once I hade the same problem, but somehow it got fixed without doing anything, so I'm not sure what could be happend to you, but try the new builds that I just did, or try Senba's builds because he makes a new build every week with my patches included. Thanks guys for the comments/feedback, if you have anything else, don't hasitate to write. Hi Julius, awesome work man, really yu shure know how to spice up the Rockbox, i was wondering wether you could help me i was wondering how was it that you changed the slpash screen, cause seriously it looks great and i was looking to do something like that myself, im currently using rockbox on my 60GB G5 Ipod, if you could please help me out with this it woul be great! Thanks a lot mate, and keep up the good work! i just wanted to ask you if your rockbox-build supports the 5.5g ipod, because on mine there is some problem by booting it (no partition found). is there something i'm doing wrong or what can i do? First of all thanks for all the posts you made and then please accept my apologies for not getting back to you earlier, I really try to do my best to handle my private things too but unfortunately lately there was to much work on me so I wasn't able to get back to you guys. As you can see I wasn't able to make new builds in the last few months and I think I won't be able to do so in the next few ones too, but after that I hope/think/looks like things will cool down a bit and I will be able to pick up the work again on the rockbox patches/builds because I really miss it, so if you can please wait a bit more and you should have some new builds to play with. No regarding future help, I recommend you guys to contact me trhough messenger I may not answer you all the time but you can be sure it will be a lot faster than commenting here and please don't be shy, if I won't answer you in the first just try again tomorrow and so on because there are days when I come home late so even if I have unanswered messenger windows I won't asnwer them because I'm to tired but next day I would do so, so just try again. So guys, that would be the situation here, so just wanted to let you know that I'm not dead and I won't let my rockbox patches/themes die either. Any updates for a 5.5G Rockbox bootloader screen? 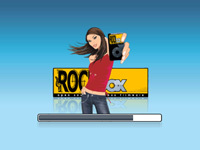 Hey, I'm using the rockbox-jbuild-5g64MB-20070322 for my ipod and I'm getting an issue with playback. After exactly 18 seconds, no matter what format the music is in, there is a quick blip of white noise then the ipod freezes. I did notice an error one time: Undefined instruction at F89B4BA0. Mean anything to anybody?